Because it’s such an enormous list, we’ve added a table of contents so you can skip to the various sections. Remember as you look through the items on this list that most of them can be donated, sold or recycled. Consider these options first before you throw them into the trash. Here we go! Not so gently used underwear. Jewelry you received as a gift that you will never wear. Costume jewelry that’s rusty or damaged. Extra buttons that come with every new shirt. Clothes that are plus or minus 2 sizes too big or small. Maternity clothes, unless you’re planning to have another baby. One half of a pair of socks missing its mate. A pair of socks full of holes or no longer comfortable. Snap jewelry bracelets and other jewelry that looked good on eBay but not so much now. Unstylish or permanently crooked sunglasses. Keep one or two high quality ones and resist the urge to buy 10 dollar ones at mall kiosks. Scarves you no longer wear or never wore. A glove missing the other side. Earrings that are missing the other side. Worn out / unsupportive running shoes. Runners should replace their shoes every 500-800 KM to avoid injury. Unused, damaged or rusty hair accessories. Hats you bought but never wear. I’d comment on this one but my other half might read this, so I’ll leave it at that. Clothes that don’t flatter you or are no longer on trend. Invest in pieces that will always be in style and part of a capsule wardrobe. Clothes that make you uncomfortable. Sweaters that make you itchy or dresses that need constant adjusting. Elastic hair ties that are no longer elastic. Neckties from the last century. Purses and bags that are never used. Old prescription glasses. I was guilty of keeping these for some odd reason, even when my prescriptions got stronger. Glasses cases. Cull the number down to at least the number of glasses or sunglasses you own. Flimsy, worn flip flops that no longer hold their shape, much less your foot. Flip flops aren’t the best choice for healthy footwear; flimsy ones are even worse. Flimsy plastic hangers that came with your clothing. Unused key chains and key rings. Thin plastic garment bags from the dry cleaners. Clothes that you haven’t worn in a year and a half. Belts that no longer fit, are no longer stylish, or are so warped they hold your pants down instead of up. Shoes that are too worn or ones you never wear. Purchase quality, timeless pieces so you don’t have to replace your collection every year. Promotional T-shirts that are always the wrong size and colour. Clothes that have lost their shape or are so discoloured you only wear them to bed. Your pajamas, if you disregard the above and insist on wearing your warped, discoloured clothes to bed. Shoes that hurt your feet or cause blisters. Halloween costumes you won’t wear again. Bridesmaid’s dresses you’ll never wear again. Excess running / workout clothing. Owning less will force you to burn more calories doing laundry more often anyway. High heels so high they make you walk like Bambi on ice. Swimwear that looked great on you 20 years ago. Not so much now. Makeup you tried once and have never worn again. Nail polish that’s all the same shade of pink. Threadbare towels or ones that have the permanent smell of mildew. Hair products you no longer use. Travel sized shampoos and conditioners you liberated from a hotel you can’t remember staying at. Eye drops that have expired. Lip balm that has expired or has melted. Air fresheners without a refill, or air fresheners with too many refills that make your eyes water (I’m talking to you, Glade). Any hair appliance like a Flowbee or crimper you no longer use. Old mascara. Bacteria can build up in the bottle and cause eye infections. Promotional beauty products that came free with a purchase. Used contact lens cases. Replace these regularly to prevent infection. Expired sunscreen or sunscreen you left in the car over the summer. The heat’s probably done a number on it. Empty prescription pill bottles you’re keeping for future storage of small items you don’t own yet. Shampoo & conditioner that didn’t agree with your hair or your nose. Loofahs and sponges that smell like mildew or are no longer intact. Tweezers that no longer tweeze. The collection of samples that has grown with each visit to Sephora. Emery boards. Use metal or glass ones to reduce waste. Emergency sewing kits. Splitting my pants at a party was an emergency, but I still wouldn’t have sewn my pants even if I had the kit with me. Sayonara, sewing kit. Broken / excess makeup applicators. How many brushes do you need? Children’s clothing that’s too small or too damaged. Donate or recycle it. Toys your kids have outgrown. Audit their toys regularly, and teach them to use one at a time to keep clutter to a minimum. Loot bag contents that you accumulate at every birthday party. Halloween treats your children collected that no one will ever eat. Age specific children’s party decorations. Thankfully, your kids only turn two once. Art from your kid’s first day at daycare. She’s 15 now and thinks it’s garbage too. Take a picture for posterity’s sake. Expired car seats. Recycle your car seat at Red Propeller. Colouring books your children are done with. Video games and accessories that are never played or used anymore. Gaming consoles, if you’ve already upgraded to another system. Unused stuffed animals. Decorations in your children’s closet don’t count as used. Most are probably like new and can be donated. Full sized, full featured strollers. Some of these cost as much as a used car. Sell yours on Kijiji to recoup some of this crazy cost. Electronic breast pumps. Another pricey baby accessory that can be sold. Kids bedroom decorations they’ve outgrown. Your teenage son probably doesn’t want cartoon airplanes on his wall anymore. Sippy cups / bottles / plates / etc. that your kids have outgrown. Bath toys with holes. Check to make there’s no mold in your kid’s bath toys because they can’t be cleaned. Safety products such as gates, cabinet locks and doorknob locks, if your children are old enough. Shoes they have outgrown or thrown into the toilet too many times. Sporting equipment that they have outgrown or lost interest in. Sidewalk chalk stubs. Save some to prevent your silver from tarnishing, discard the rest. Plastic syringes that come with kids’ medicine. You’ll get more when you get more medicine. Broken / outgrown backpacks and bags. The rubber ducky with the built-in thermometer that tells you the temperature of the bathwater. Apparently your new-parent lack of sleep made you distrust the feelings in your wrists. Baby monitors, once your kids are no longer babies. Almost empty bubble bottles. Consolidate them and discard the empties. Tacky serving dishes you received as holiday gifts from your neighbours. The bag of expired takeout packs of ketchup in your fridge. The bag of sweet and sour sauce McDonalds keeps giving you with your nuggets even though you specifically request they not give you any. Expired canned goods from your cold room or pantry. Remember that some food banks accept these up to a year after their best before date. Travel mugs you never use or are damaged. Most people only ever use one. Duplicate kitchen utensils—these, and the next few, may already be gone if you read our article on organizing your kitchen. Excess dishware you don’t use because you don’t have a table big enough for 20 people, let alone 20 place settings. Excess bakeware and cookware that are also never used because you don’t own a commercial sized stove. Novelty kitchen gadgets like the banana slicer you bought before you learned how to use a knife. Cookbooks—it’s 2016! The internet is your friend. Unused small appliances, like the Ronco rotisserie or the Panini maker that’s still sealed in the box. Flimsy takeout plastic cutlery. I swear these return from the garbage every time we’re done decluttering. Chocolates or candy you received as a gift and will never eat. Reusable water bottles that are too small, plastic or promotional and low-quality. Use glass or stainless steel ones. Bottle openers. You don’t need to open 10 bottles at once. Keep the best. Chuck the rest. Takeout chopsticks. Tell them to hold the chopsticks when you’re ordering so they don’t pack them in the bag. Wine / liquor / beer bottles. Return them to the beer store or let your local scavenger do it for you by putting them in your blue bin. Chipped or otherwise damaged plates, cups and mugs. Unused plastic containers. Whether they’re mismatched Tupperware pieces or old takeout containers, these are common sources of clutter in the kitchen. Stale pasta / cereal / crackers / chips. Buy in bulk if you regularly waste food because of super-sized packaging. Specialty shaped cake pans you will never use again. Cookie cutters you tried baking with once and failed miserably with. Scratched non-stick pots and pans. While it may not be as dangerous as once thought to use scratched non-stick pots and pans, they’re still more likely to release toxic compounds during heating. Kitchen knives and knife blocks. Most people only use a couple of the knives out of the 20 in their knife block. Declutter your counter and ditch the extra knives as well as the block. Expired coupons or coupons you’re keeping in case you need your month old driveway resealed. Takeout menus for restaurants that have online versions—they’re more up to date online anyway. Samples you unknowingly accept while you’re still half asleep at the train station every morning. Empty pasta sauce bottles and similar bottles you’re keeping to repurpose but haven’t. Fortune cookie fortunes. If you’re a sucker for this kind of thing, have at it. Plastic grocery bags. Reusing these as garbage bags is great, but if there’s too many coming in, then switch to reusable bags and consider recycling the excess. Diet potions and snake oils that didn’t work. Unidentifiable frozen goods in your freezer. If you can’t remember what it is, you probably shouldn’t be eating it. Extra cocktail shakers. One is plenty. Excess shot glasses, unless you’re still throwing frat parties every weekend. Duplicate measuring cups and spoons. Spicy sauces you never eat. The quest for the best spicy sauce can leave a trail of abandoned sauces in your fridge. Memory cards of various types whose capacity is too small for today’s phones and cameras. Obsolete portable external hard drives. Instruction manuals—most are available online now. Duplicate USB cables for your various devices. Every device you buy comes with one and they accumulate over the years. Data & music CDs. Transfer all the music and data onto hard drives, memory cards or the cloud, because you’re probably using the music or data on your computers and phones anyway. 8 track cassettes and cassette tapes, and the hair you kept when you shaved your mullet off. Travel alarm clocks. Yet another relic made obsolete by the mighty mobile phone. Out-of-date mobile phones, unless they’re smartphones. These can be repurposed into a toddler sized tablet or baby monitor for an IP camera. Phone covers and screen protectors from your first generation iPhone. DVD’s. They won’t look very good on your 4K TV anymore anyway. Upgrade to Blu-ray or get Netflix. DVD & CD binders, spindles and cases. Rechargeable batteries for devices you no longer own. Expired unused batteries. Chances are you no longer own the device you bought them for. Installation CDs. Many devices come with these, but I don’t really know why. If you’re installing something on your computer then chances are you have internet and can download the software just as readily. Inexpensive earphones you bought when you forgot your own on the plane. Old TV’s. Find out what to do with these and other old electronics here. Unused low quality Bluetooth speakers. VHS tapes and the VCR. Transfer any important content to Blu-ray and donate the tapes. Extra mice and keyboards from old computers. Computer memory, video cards and other computer components you probably got back from the installer when you upgraded your computer. Landline telephones, if you’re one of the many who no longer have a landline. Once-cool electronic gadgets that now reside in your junk drawer. Point and shoot cameras with camera technology comparable to the iPhone 3. Receipts for items that do not have a warranty, or for items whose warranty has expired. Old bills and tax records older than 6 years (in Canada). Extra binders, folders and portfolios. Greeting cards. Take a picture of any you have been saving for sentimental reasons and recycle the rest. Catalogs from Sears and Canadian Tire you somehow got subscribed to. 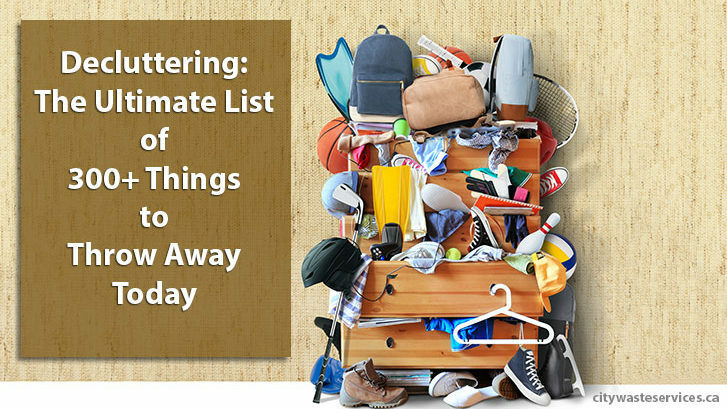 Make sure you remove yourself from their list to reduce waste going forward. Magazines you may or may not keep in the washroom. We have phones and tablets for that now. Various organizers to help with decluttering. Everyone buys a couple of these hoping they’ll help with the clutter. And they sometimes do, for a little while. Then they just add to it. Pens & pencils. Some people are always running out of these. They’re all at our house. Please come and get them. Keepsake gifts. You know, plaques with motivational words and similar items. Some people love being surrounded by gifts backed by sentiment. Some people don’t. Choose your preference and edit accordingly. Day planners. Unless you’re technologically challenged, use an electronic version. Your paper based day planner won’t scream at you when you’re about to miss your meeting, but your boss will. Unused picture frames you purchased at an Umbra sale before you realized it was 2016 and you would never print another picture again. Highlighters you haven’t used since university. Completed or unused puzzle / Sudoku books. Computer software from your first computer. Phone books / Yellow Pages. Amazingly, we still got one of these as recently as last year! Calendars. We get several at the end of every year from real estate agents, T&T and our insurance agent. Travel brochures / itineraries. The ones in your carry-on from the last vacation. Remove them and dump them all in your blue bin. Keys that don’t belong to any lock. At least not any lock you can remember. Gift bags. Keep some good quality ones. Recycle the rest. Rewards cards. There are apps that can store this information now. Business cards. Store the information in your phone instead. Souvenirs you receive from people returning from vacation. A bottle of sand is a great reminder you’re not on the beach when it’s -40 degrees out. Dried wedding bouquets or other dried flowers you’ve kept for sentimental reasons. Elastic bands that are no longer elastic. Books no one has read or will read. Textbooks you or your kids will never use again. Used university texts are usually in high demand, so try selling them first. Large paper bags from clothing stores. We keep some of these for transporting wrapped gifts from time to time. No need to keep 20. Arts & crafts supplies for a completed project. Get rid of them now or forget what they were for later. Loose foreign coins. Find someone going on vacation soon and give it to them. Gifts you never liked but kept out of guilt. Conference supplies like name tags and lanyards you no longer need. Trophies from your bowling league when you were 11. Your bowling ball from when you were 11. Collectible items that are collecting dust and make you more miserable than happy. Training manuals and other items from a previous employer. Coffee table books you received from your mother-in-law that stretched the limits of your acting ability when you said “aww, you shouldn’t have!” upon opening it. Medals and awards from races or events that you can’t remember. Expired passports, government issued identification and credit cards. The last one is obvious, but some people hang onto the first two for sentimental reasons. Extra wedding programs and items you kept from your wedding. The guitar you thought about learning to play and didn’t have time for. Board games that haven’t been played in a year. Dried up glue or glue containers that are cemented shut. Hand / foot warmers well past their expiration date. Novelty desk toys whose novelty wore off after owning them for a day. Road maps, unless you live in 1999 and don’t have a smartphone or GPS. Use HERE WeGo on your smartphone if you don’t have mobile data for offline navigation. Disposable cameras, unless they’re waterproof. Even then, check their expiry date. Dry erase markers missing a board. Or the board missing the markers. Extra mouse pads, unless you own a mouse from the last decade. Scrapbooking supplies for “that day” when you start scrapbooking. Diaper boxes or any cardboard boxes you’re keeping just in case you need them for storage. IKEA Allen keys, wooden dowel and extra pieces. Fans of IKEA furniture, or other assemble-it-yourself furniture will have piles of these lying around. Have you ever used one? Dated or ugly holiday décor you never use. Product boxes. You’re probably not going to return the TV you mounted to your wall 2 years ago. Sports equipment for that sport that seemed like a good idea for a month. Paint that’s dried up or whose containers are disintegrating. If you’re afraid you’ll need it for touch up, use a mason jar to store the little bit that’s left. Unstable folding chairs you keep just in case you need an extra chair for someone to fall off of. Duplicate tools. A couple of flathead screwdrivers can be useful. Three or four are not. Power tools you kept when upgrading. I’m not one to get in the way of a man and his power tool, but you’re never going to use the old one again. Besides, its battery is probably on its last legs. Christmas ornaments you no longer use. Shoe boxes you’re keeping just in case you buy shoes that don’t come with a box. Abandoned projects. Be honest and move on if your 1 week project that began 5 years ago is still a work in progress. Leaky garden hose nozzles and sprinklers. Buy a quality one so you’re not wasting water. Unused light fixtures you upgraded when moving into your new home. Register covers you replaced when you moved into your new home. Flotation devices your kids have outgrown. Snow shovels. Get rid of the ones that hurt your back and don’t clear much snow. Extra coolers, especially soft-sided promotional ones. Excess extension cords, particularly the 2 pronged variety. Surge protectors that have absorbed too many surges, a large surge or have their warning indicator on. They’re no longer protecting your equipment. Home décor that your walls and tables have no room for. Scrap wood you’ve hung onto for future organization and decluttering projects. Like building shelves in your garage next weekend. Or next decade. Ab roller and similar contraptions that promised you would have a six pack after 6 easy payments and no changes to your diet. Old bicycles. Your kids will outgrow their bikes eventually. No need to keep the old ones as family heirlooms. Foam rollers that have become more foam than roller. Wicker, plastic or cardboard baskets. Extra baskets are extra clutter. Rugs that no longer suit your décor. Small step stools the kids used for the sink and no longer need. Garden shovels. You’ve probably accumulated a few but only use the one you don’t have to bend back into shape after using it. Keep that one. Discard the rest. Unused furniture you’ve hidden in your basement. Learn more about renting a dumpster if you have a lot of old furniture to dispose of. The stationary bike that’s stayed stationary since you bought it. The treadmill whose belt is as stationary as the bike. Extra rags. Repurpose some of your old T-shirts to make more. Home décor that was popular when John Travolta was afflicted with Saturday Night Fever. 3D, double-sided, 10,000 piece puzzles and other impossible puzzles no one has attempted. Leaky inflatable swimming pools, or ones that have been outgrown. Leftover hardware from a completed home improvement project. Excess or worn throw blankets. Old or worn accent pillows. Bed pillows that have become flat or weren’t suitable to begin with—I went through 6 types of pillows types before I finally found mine. Extra / old bed linens. Keep only the most comfortable ones because you won’t get a good sleep on the rest. Pet toys and accessories that are worn or not used. Expired pet snacks or food. Tea lights. Usually coming in a bag of hundreds, you probably don’t need these unless you’re into aromatherapy or fondue—oh wait, you got rid of your fondue right? Your toilet. Just get rid of it. Who needs one anyway? Just kidding! Checking to see if you’re still paying attention. Cleaning supplies that you have tried but no longer use. Take a look at our article on hazardous waste to learn how to dispose of these properly. Posters of Madonna from 1985 you’ve kept with your ghetto blaster when you used to breakdance. The same ghetto blaster from 1985 that only accepts the cassette tapes you already got rid of. Plants. Plastic or real, if they’re an eye sore, it’s time to let them go. Candles. Keep a couple for emergencies if you must, but let the rest go. Broken umbrellas. Every day it rains, I swear I see at least one person walking around with a broken umbrella. Replace it with a quality one and stop producing garbage! Duplicate cleaning tools. Brooms, mops and Swiffers. People develop preferences and never use the rest. Was that the biggest list of anything you’ve ever read? Thankfully, you’ve reached the end of our article and the beginning of your decluttering adventure. Remember that most items you’re going to get rid of can usually be donated, sold or recycled. Consider throwing them in the trash only as your last resort. Find us on Facebook or Twitter for regular tips, news and updates.